Parents know everything there is to know about the animated franchise, Madagascar. They never had a choice. In an age of videos, DVDs and Blu-Rays, ever since 2005 when the films began, repeated home viewing was compulsory. There can hardly be a mom or dad who hasn’t had to step up to the imaginary mic and join their children in yet another chorus of Reel 2 Real’s I Like To Move It, making them instant, living room, rock stars. Despite the enormous popularity of the big screen Dreamworks Animation series, they’re also aware of how the quality started to go south once the sequel was made, then a third outing, followed by spin-offs, short features, and even a television series. Fortunately, family audiences attending Valley Youth Theatre’s new live presentation, Madagascar: A Musical Adventure, will be pleased to know that the show, now playing at Herberger Center until November 19, is the origin story, the one that started it all, based on the original film, and that’s definitely a good thing. 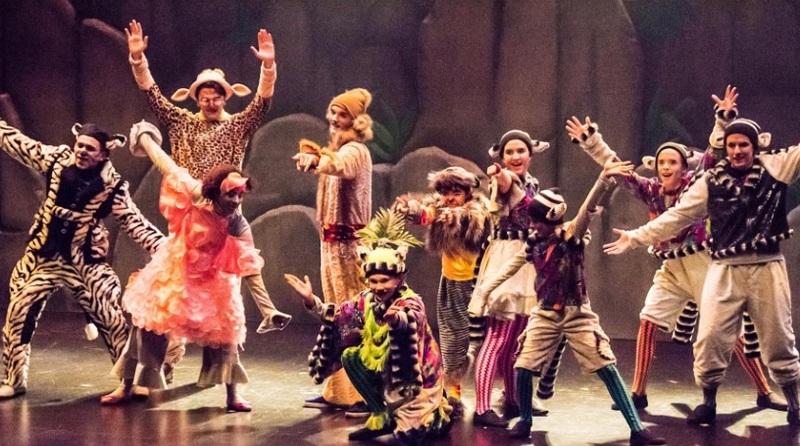 After a 20-year association with the Herberger Theater Center, Madagascar is something of a milestone for VYT; it’s the company’s 40th production away from its home, several blocks north on North First Street. The show is presented on the smaller, slightly more intimate Herberger Stage West, and that’s another good thing. 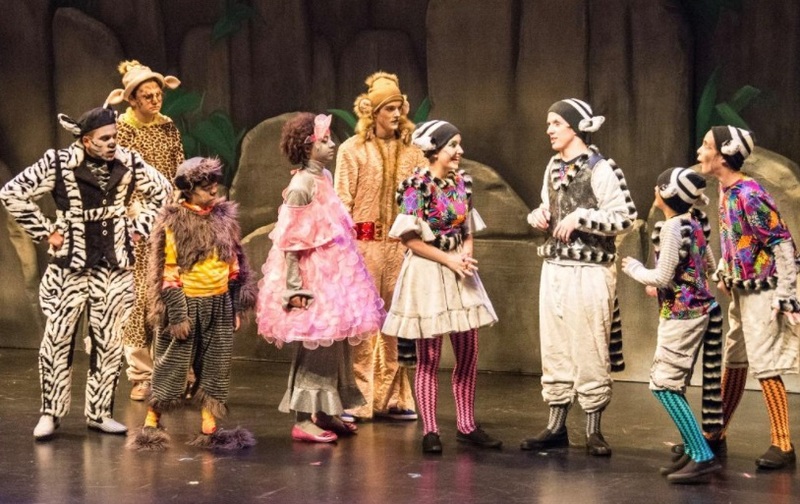 Unlike the grander, musical productions that traditionally begin and end VYT’s season of family productions on Herberger’s larger Main Stage, Madagascar: A Musical Adventure is somewhat smaller in size, length, and ambition; Stage West is the perfect forum. In truth, not a great deal occurs, and what does take place zips by at lightning speed. 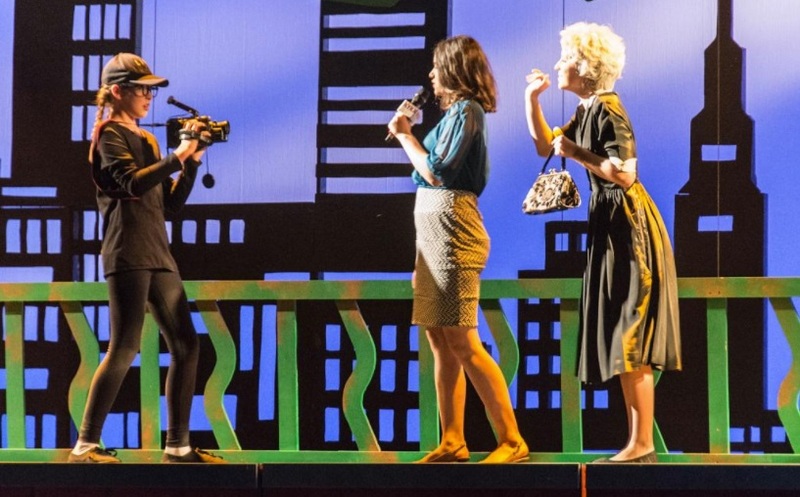 The show usually runs for 75 minutes without a break, but director Bobb Cooper has inserted an intermission and cleverly opens the second half in a way that doesn’t feel as though a pause was ever shoe-horned into place. Once the animals find themselves stranded on the island country in the Indian Ocean, they’re immediately treated to King Julien’s I Like To Move It, joined by the cast and aided by a whole set of youthful safari hunters in their khaki shorts and hats, dancing in the aisles. When the second half begins, we’re treated to a reprise, though this time lead by the khaki-clad mini Steve Irwin’s who have now sprung from the aisles and commandeered the stage. But the real fun of the musical is not so much what happens, it’s the characters themselves and the script’s constant wit. When we first meet the animals, they’re enjoying their existence in the safety of the zoo. The food is regular and the adoration of the crowds feeds their egos, particularly Alex the Lion (Hayden Skaggs) who ad-libs a ‘call-me’ sign with his paw to on-lookers enjoying his daily king of the jungle performance behind bars in his cage. Unlike those large-scale family Disney musicals adapted to theatre, Madagascar is aimed squarely at the young, the kind of show you might see as a holiday special for Saturday morning TV viewing. But don’t mistake that for any lack of standards. The whole production is ablaze in vivid, eye-catching color, and even though the musical may feel somewhat smaller in scope, with its detailed, imaginative sets, its costumes, the effective kaleidoscopic lighting, the peppy choreography where characters bob and weave around each other, plus the overall energy of the young performers, Madagascar: A Musical Adventure rises to the standards of any VYT Herberger Theater presentation. Some of the fade-out breaks between scene and set changes often feel a beat or two longer than they should, pausing the flow, as if things have temporarily dropped to a lower gear, but once the following scene begins, the pace immediately picks up. And its target audience won’t mind. Waiting for something to happen only prolongs the anticipation of what’s coming next. 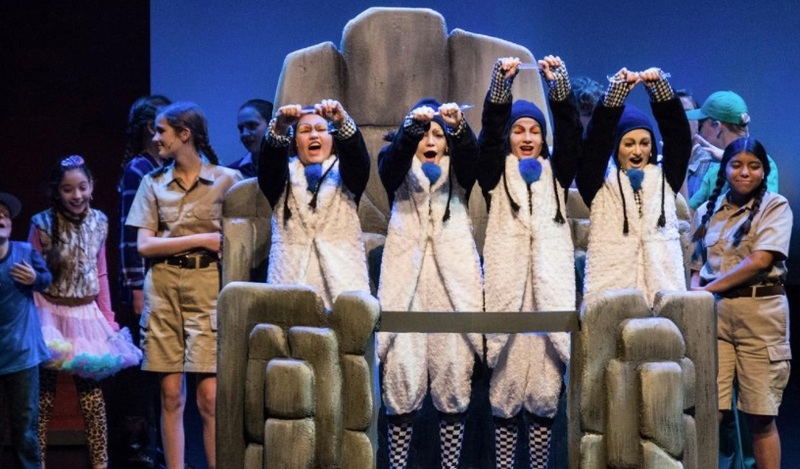 Even if the parents may feel they’re sitting in the dark longer than they should, younger theatregoers for whom the show is designed will be thrilled throughout. And be prepared. What you’ve sung in the living room as a family ever since the original Madagascar was released on DVD will be repeated in the car. Performing I Like To Move It on the way home won’t be a request, it’ll be mandatory.